MacDailyNews Take: Eddy Cue. Always driving hard. Just the type of A+ player Steve loved. Steve would be so proud. And give Apple a break. How’s a company sitting on only $250 billion supposed to be able to properly market a new service? But, of course, signs cost money and simple incentives require upper level executives to have a smidgen of imagination and foresight. And, of course, the new iPhone works with Apple Pay and, starting today, for every $100 you spend using Apple Pay, you get $1 off at Apple retail and online stores. So, spend $100 on groceries using Apple Pay, you get $1. Spend $300 on a plane ticket using the Delta app, you get $3. Use Apple Pay in your ExxonMobil Speedpass+ app to buy your gas. It all adds up! By the end of the year, you’ll likely have quite a discount on your next iPad, Mac, or iPhone! Would you use Apple Pay more if Tim Cook said something like that? We know we certainly would. So would tens of millions more people than are using Apple Pay today. Incentivize its use! Give Apple Pay users a percentage of every dollar spent via Apple Pay to spend at Apple Stores. Something. Anything! Get people used to using it first. Sheesh. It’s really not that difficult. It really isn’t. When is the last time you saw an ad for Apple Pay? Great point. Introducing a disruptive alternative to an established workflow is always a marketing-intensive, expensive proposition, and Apple hasn’t really tried. I mean, to be fair, without any significant marketing, they garnered $20B of purchase activity, but in the grand scheme of Apple’s budget and the TAM (total addressable market) of all Point of Sale purchases, it’s a piddly sum. Just imagine though what they could do with a little effort, on the scale of the marketing push with the launch of the App Store! Remember that? Full page ads in every local, national, and international newspaper, every major magazine, basically everywhere you looked. But the other challenge is that it’s still easier to pull out a credit card and purchase than to try to tap your watch or phone, notice that it failed, try again, and then sigh and pull out your credit card and purchase. Been using ApplePay since release in USA. I still find people who are not familiar with the concept and have to explain it to them. However, there are also a greater number of store clerks that have now seen it and LOVE IT when compared to the “chip-card” BS that really slows down the checkout lines…!!! I also find myself using ApplePay businesses more than others due to the ease of payment….. I use Apple Pay as my preferred payment option here in the UK, but the biggest drawback is that the banks will only allow it to be used for purchases up to £30, which often doesn’t even cover a modest supermarket ‘top-up’ shopping trip nor will it let me fill my petrol tank. That’s the two most frequent transactions for me and the banks have made both impossible via Apple Pay. I always used to use cash as I found that with credit cards, it was difficult to keep track of what I’d spent. There was no simple place for me to keep all the receipts as I only have a wallet and almost never wear a jacket, so receipts tended to get mislaid. With Apple Pay, I can see a listing on my iPhone showing exactly what I’ve been spending. It would be great if Apple could introduce a feature where I can draw a line at a desired point under my recent transactions and it would add up all the payments above that line so that I can check what I’ve been spending. The system has been totally reliable for me, without a single failed transaction. I once helped a neighbour who couldn’t make Apple Pay work and noticed that he pressed the home button hard to authorise the transaction, which of course took him back to the home screen. Once I pointed out that you only need to lightly touch the home button to register your fingerprint, it’s been working perfectly for him ever since. I expect that limitation to change. The banks are already talking about raising the ‘contactless’ limit to £50 since they have detected no discernible increase in fraud claims, which will be followed by a similar limit for ApplePay. I can see how a cost limit is appropriate for contactless payments because the only identity verification is possession of the card and the user could have stolen the card, however with Apple Pay, the transaction is verified every time, so the opportunities for fraud are minimised and therefore there should be no need to have such a low limit. Somehow, that small detail has been omitted in every single review of ApplePay I’ve read. Having all my receipts on one monthly statement is precisely why I use one, and only one, charge card for everything. Up to now I had thought I would lose that feature to move to ApplePay, so thanks for pointing it out. The only remaining snag is all those annoying “loyalty” (info-mining) cards that I am forced to use to get sane prices. They force me to take out my wallet anyway, so why not just use the actual card while it’s out. Just to clarify things, it’s not one monthly statement on Apple Pay, your iPhone lists all recent transactions right up to the last millisecond and it has a list for each of your cards which have been authorised for Apple Pay. For my purposes it’s absolutely ideal as I can use either my credit card or my debit card with a different bank and I only need to glance at my iPhone to see what I’ve been spending recently. As more of my cards get renewed and offer contactless payment, I’m getting more of my cards set up for Apple Pay. For anybody who doesn’t know about it, in Apple Pay, click on the particular card, press the “i” button and look at the transactions, which are listed with the most recent ones at the top. It’s amazing how often people review apps rather superficially and completely fail to mention really useful features. Well the Apple Pay stickers look very cheap. Doesn’t inspire confidence at all. They should poach some marketing/branding talent from Visa. Cashiers are among the lowest of intelligence out there. What would you expect? These aren’t tech-savvy people or they would have tech jobs instead of something that should have been automated by AI and machines a long time ago. And that excuses Apple’s lack of marketing, signage, and incentives, how, exactly? If Apple properly educated and incentivised the public, the cashiers wouldn’t be an impediment. Customers would demand it and stores would make sure it worked and the help knew what it was and could execute transactions. Sometimes I think the MacDailyNews Take writers could run Apple better than Cook, Cue, and Schiller. At least MDN would have signs and incentives for Appel Pay and we’d have a kickass, expandable Mac Pro right now, today – and it would’ve been updated regularly for the last four years, too! Yes, I am going to say how Apple should spend some of it’s money and no one likes that. But you have $700 Billion cash, spend a little bit of it educating businesses, small businesses, mom and pop businesses on what Apple Pay is. Send every company in America door stickers and point of sale stickers to let people know Apple Pay is accepted at this store. Educate businesses why Apple Pay is more secure and quicker which leads to more profit for them. Run some TV ads about Apple Pay. Apple has $700 billion in cash? Oh crap. 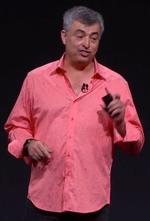 Eddie Cue is in charge of Apple Pay. Small banks and credit unions moving slow to adopt Apple Pay. My credit union is planning on it but have not rolled it out yet. So there is four people in my family that can’t use it yet but would be enthusiastic users when available. Offering 1.00% back on Apple Pay transactions would be stupid because Apple only makes 0.15% on the transaction. Apple quite rightly would not pay people to use it. In a nutshell the incentive is points per transaction that scales higher the more transactions you perform in a month. You know, the system is still so F’D up. One place accepts Apple pay, another accepts chip, another accepts chip on for credit, but swipe for debit, and on, and on. It is just one massive clusterf**k.
That may be true in your country. Other countries have universal acceptance of chip and PIN cards with contactles being increasingly available as well. If contactless is available, Apple Pay should also be available too, but in some places that isn’t how it works out. Banking and payment technology is considerably more advanced in Canada and Europe than it is in much of America. I’m with you but the banks don’t see it that way and it’s in their interests to limit ApplePay if they can. It reminds me of how music labels resisted iTunes initially, but eventually decided that it was in their interests to get on board with Apple. I don’t think that major banks or retailers will hold out indefinitely.